Note: This is the third in a series on environmental history and early modern history cross-posted with NiCHE, the Network in Canadian History & Environment. Peter Fidler was going where few Hudson’s Bay Company (HBC) traders had gone in the summer of 1800: the South Branch territories of present-day southern Saskatchewan and Alberta. He was to build Chesterfield House at the junction of the South Saskatchewan and Red Deer Rivers, deep in the drier, xeric grasslands of the Northern Great Plains. Likely carrying his instruments, nautical almanacs and books to continue his work as a company mapmaker, Fidler also had at hand the diary he was to keep daily records in, his “Journal of daily Occurrences” as the HBC called them. Every trader at a post was to keep them, day in, day out. 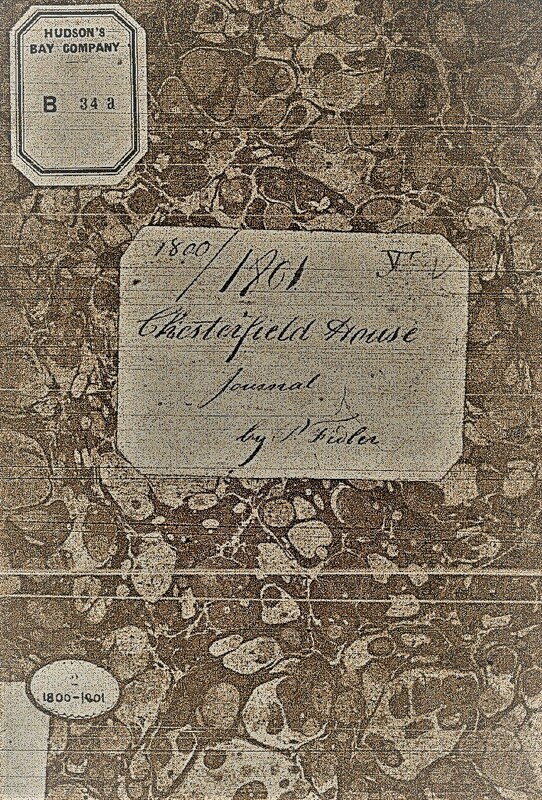 My interest in Fidler’s journey to build Chesterfield House is not really what he wrote in his journal, but what he didn’t. We know fur traders left a lot in their post journals, correspondence and reports. The earliest HBC post diary survives from Fort Albany covering 1705-06 on James Bay. Those kept at other posts at James and then Hudson Bay, constitute a window into the “long” 18th century in Canada’s environmental history. That record expanded when the company rapidly built posts far into the interior of North America beginning in the 1780s and continued to grow in its proliferating post system in the early 19th century. What makes the HBC archives one of the premier collections in the world for Indigenous, botanical and zoological historical studies, not to mention historical climatology, is the wealth of information found in the hundreds of the post journals left by its traders. They were written because the company’s London Committee insisted almost from the very beginnings of its fur trading in 1670 that its “factors” (or traders) keep a daily post journal, post lengthy letters to home and do bookkeeping accounting of their trading. One would expect to find much in Fidler’s journal from 1800-01 and the one he continued through 1801-02. Fidler was astute in observation. He exemplified the 18th century turn to precise and more empirical observation and, in many respects, the larger interest in Enlightenment science to classify and categorize both human societies and nature. Above all, Fidler charted the natural space around him: its dimensions, the way he traveled and how he positioned himself within it. Fidler rigorously recorded weather observations at almost every post he served at. And it was at Chesterfield House where Fidler famously included in his post journal a number of maps drawn for him by visiting chiefs who drew the Blackfoot world along the Eastern Slopes of the Rocky Mountains. When he sent these home, the London Committee shared this treasured information with the influential cartographer, Aaron Arrowsmith, who incorporated the Blackfoot information in his own maps to change the ways Europeans understood the western portions of the North American plains. All the same, the journal entries quickly disappoint a reader. Fidler noted precisely information important in his dead reckoning and therefore map making: his compass bearings, direction on the South Saskatchewan and general topography. What is most striking is what Fidler didn’t write in the journal. Alice M. Johnson, who published Fidler’s company journal in 1967, included in her footnotes excerpts from Fidler’s rough version of it, as well as a personal copy Fidler kept in which he added greater detail. Reading the three together, we can perceive how sparse Fidler’s entries were in his official journal. He held back a lot from his employer. Moving between Fidler’s company journal and his personal copy, one can see which information merited mention for official purposes. For his company readers, Filder simply recorded the observation one day: “Light breezes and variable thick smoky air and very hot,” but for himself he added mention of stone traps used by plains hunters to kill small foxes. A few days later, his official journal wrote: “WbN ½ S1 ½ high drift of sand north side and the ground is quite different from before.” But he inserted into his personal copy description of the “fine level barren ground great numbers of Tent places here.” He saw teepee circles abandoned earlier by plains people where he found “some few old fragments of wood, fireplaces or a round circle of stones that are up on the bottom edges of their Tents to prevent the winds blowing them down. Pegs are used when they have them in preference” (August 31). The same day’s official entry noted “a deep large creek on S. side comes from the ESE, little water in it.” But Fidler’s personal journal named the water body “Beaver Creek” where, “almost every 20 or 30 yards” beaver had dammed up its length. The beaver in these colonies had so intensively felled the poplar stands that there was now “not a single one standing for a good distance on either side.” Now without food or wood materials, the beaver had abandoned the area, vacating “for a more plentiful place of food.” Those that hadn’t had died of starvation. Their carcasses littered the ground. And so on. What is remarkable in the company’s official journal is really what isn’t in it. In his personal copy, this inquisitive and curious mind registered prickly pear cactus, bison in the rut, and his men being attacked by “an old Grizzle She Bear & her 2 young ones of a year old & more.” For the company, his journal recorded sights of bison herds, their location, and estimates of their numbers. By his second season at Chesterfield House, he even tried to count them, the “thousands on thousands of buffalo in sight from the house,” (December 29) and a few days later in January 1802, “Millions of buffalo all round the house….” But it was really in his personal journal that Fidler provided greater detail of the bison’s seasonal migrations, watering and wallowing. The question is why did Fidler report so little to his company overseers? Historians of science are increasingly interested in not only the ways that 18th century Enlightenment science inventoried, classified and categorized nature; they are also taking up the study of “agnotology,” that is, the way 18thand 19thcentury knowledge gained by explorers, botanists and natural historians was not communicated back home. This was the “non-transfer” of knowledge in the 18thand 19thcenturies. Londa Sheinbinger, drawing on Robert Proctor’s coining of the expression in his medical history research, demonstrated how the knowledge of colonial botanists, who otherwise collected and described all manner of plant life, was constrained by economic, transportation and cultural barriers in its flow back home. For instance, she pointed out how knowledge and even samples of abortifacient plants – those used by Indigenous people to induce abortions – were often not shared by botanists with Europe in the early 19th century. Agnotology is a useful concept when analyzing Fidler’s journal writing – at least in respect to the limited information he was sharing with his company. We see how he, too, was transferring very little of his knowledge of the natural world in the South Branch of the Saskatchewan in 1800. This self-editing suggests an important reality of not only Enlightenment science, but, easily forgotten, 18th century commerce. My interest in this important matter was developed in my recent Business History article on “knowing nature in the Hudson’s Bay Company,” and a contribution in the works for a Great Plains Environmental History anthology convened at the University of Oklahoma. Canadians should take seriously agnotology in the “long” 18 thCentury. Most of the paper record of Europe’s engagement with Canadian nature supported powerful merchant interests coordinating what amounted to a ransacking of natural staples – whether fish, fur or timber. Our natural world was frequently exploited not only by the actions of individuals but by the flows of information that made their work profitable, and even possible. John Richard, writing his environmental history of the early modern period, demonstrated the ways that early state formation and merchant capital began exploiting an “unending frontier” of resources across the globe. Such a far-spanning reach by merchants depended almost completely on disciplining the flow and types of information derived from distant places. 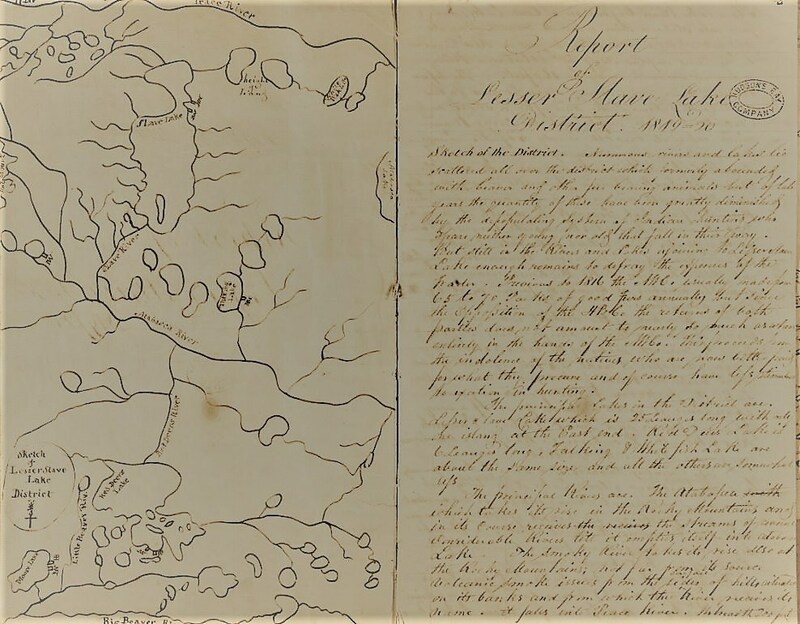 A district report written from Lesser Slave Lake, 1819-20 sketching navigable rivers and in separate headings of text, its soils, vegetation, animals and climate. The point is that Fidler wasn’t describing as much as he could in his official journal because it was a business document. His post journal was situated in the overall accounting traditions of the HBC. Resting on the model of factor trading, in which traders represented the company’s stock and transactions abroad, letters, accounts and trader diaries wrote within a larger system of accounting that made possible a trader’s efforts to expand his trade and geographical reach. Double entry was not just a business technique. It was a way of thinking about the natural world. As Mary Poovey argues, double entry became a means of imaginatively but concretely engaging in a world and removing oneself from otherwise contentious theoretical and spiritual metaphysical debates. Indeed, she suggests that double entry, with its emphasis on numbers and the quantification of real things, laid the foundations of the “modern fact” becoming fundamental in the rise of early modern natural science. Anke Te Heesen also argues that double entry significantly influenced the ways that even natural historical studies were undertaken in the 19th century. By this point, it became a habit of mind, a way for an individual to inventory the world around him or her, or even figure out the financing of travel and exploration that yielded moments of discovery. A technique that traces to the late middle ages, double entry bookkeeping was monumental in its importance as Europe expanded its commercial reach in the early modern period. In a commercial world where transactions were based largely on credit, and a merchant was concurrently trusted with goods from many while he extended them in debt to others, double entry made sense of a trader’s real standing in an otherwise bewildering personal universe of credit relations. 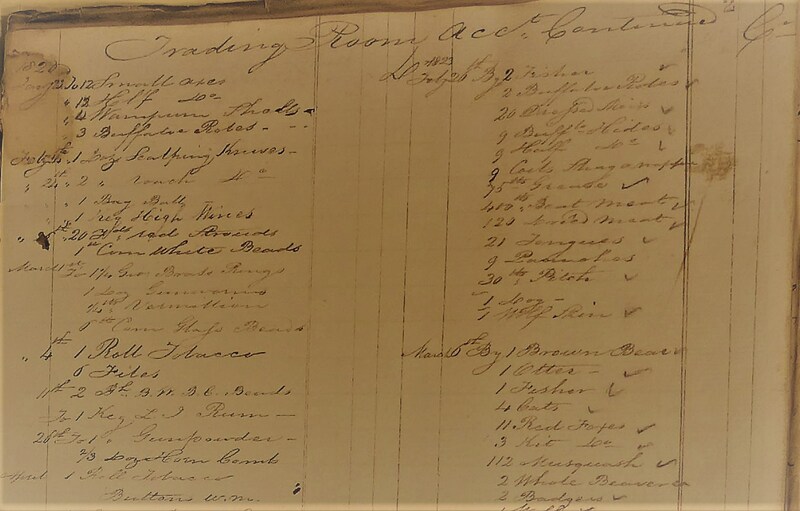 Double entry also helped a merchant keep track of his real cash on hand and the transfers of goods he was making either locally or half the globe away through bills of exchange or promissory notes. By the 18th century, Britain’s massive commercial reach, whether to slave sugar plantations, “adventures” in sea otter trading on BC’s coast that sold product in Canton, China, or in the HBC’s fur trade in the interior of in North America, ultimately depended on double entry. 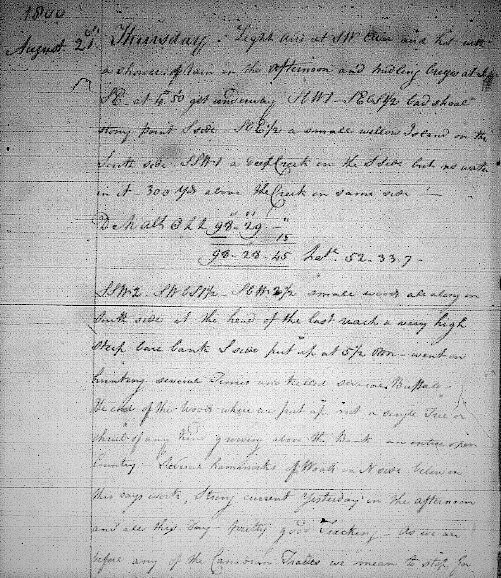 The HBC Fort Ellice Daybook showing daily transactions in the fur trade, February 20, March 6, 1823. The ways of thinking in double entry bookkeeping are seen quite explicitly in John Mair’s Bookkeeping Modernized: Or, Merchant-Accounts by Double Entry, first published in 1768 but reprinted again in 1800. It was really a textbook offering practice exercises to young clerks who had to learn this business technique. After long descriptions of the use of promissory notes, bills of exchange, digressions into a short history of Great Britain’s trading companies, or the use of the accounting in slave-labour sugar and tobacco plantations, Mair introduces his readers to the way to distinguish between credits and debits, the importance of opening and closing inventories, and the way to reassemble a daybook’s transactions into accounts, and finally a balanced ledger, this to gain an understanding of a merchant’s real standing. Mair takes as a given the global reach of merchants in the 18th century –most London merchants purchased goods for resale both locally and in the colonies. So, Mair explained how merchants had to keep distinct their myriad “adventures,” say in a part of cargo in a ship leaving to Barbados or New York, how to best enter losses from a ship sinking at sea, and how a trader acting on behalf of a merchant abroad should advertise, sell and account for goods entrusted to his care. In its most basic form, double entry stripped complex social, economic and cultural human exchanges to commercial transactions understood as both credit and debit at the same time (hence the expression “double entry”). I often confront the effects of double entry thinking whenever reading HBC journals. Newcomers like Fidler, especially those explicitly trained up as clerks in the company’s employ, assessed the natural world as a veritable stock on hand at the beginning of season. At least in their business reporting, they often limited their observations to “facts” as useful knowledge to the company. This manner of thinking removed entirely ecological complexity in nature. Indeed, the very purpose of double entry was to harness the utility in nature, reduce it to discrete parts, and account for its component elements. As I read Fidler’s journals then, I read the effects of a commercial mindset and way an individual flowed a particular sort of knowledge within a joint stock company – one of the many types of firms supported by merchant capital. These were seizing the natural world around the globe in the 18th and 19th centuriesand manifestly contributing to what we understand as the age of the Anthropocene. In my Pre-Confederation History classes at the University of Calgary I try to impress on students the importance of understanding the longer history of Canada before it was Canada. The constitutional innovations and government traditions in Quebec after the Conquest, the conservative nature of government in the 1790s, especially the reserves of crown resource so important in our environmental history, the commercial and political habits of responsible government in the 1840s: these resonated into the arrangements of Confederation that follow us, arguably, to the present day. But a fundamental understanding of how we understand the natural world – whatever the romantic tradition in the 19th century – rests in many ways on very old European business techniques supporting empire-building. Fundamental to those techniques was accounting that trained the mind to see nature in certain ways and influenced the way European merchants and traders wrote about it. For that reason, many understandings of nature we see as significant to the postwar period – high modernism and resourcism come to mind – have in fact very long roots to even the early modern period and the thinking of commercial empires that remain as a heritage in Canadian history. Featured image: New Discoveries in the Interior Parts of North America (detail), A. Aarowsmith, 1811. David Rumsey Historical Map Collection. A very useful book to read on the cultural and political effect of double-entry book-keeping is Jacob Soll’s The Reckoning (Basic Books, 2014).